Nicole and the cleaning staff were lovely, helpful and made us feel welcome. We are going back next year- that about says how wonderful it was! Everyone was friendly and kind. Manager Response: Judy, it was wonderful hosting you and Alvina. I'm thrilled you have already booked your vacation for next year! I only dealt with them when booking the unit, and everything they promised to do, they did. I will definitely stay again. The new system is wonderful, the fact the condo is kept homestyle is comforting for those of us the live here, rice cooker, a little coffee, filters etc. We left our condiments as well. The beds are comfortable, the amenities are great, the cable TV connection fantastic. We watched a movie that stated it was charged to the cable bill, that we owe for. The managing team jumped into action and repaired challenges, the security team is friendly and helpful We will be back, we will be contacting you for multiple condo rates for our association to stay on turtle bay combined properties. We had a very nice time, thank you for making it affordable and relaxing, for us to have a staycation. Nicole was great. Appreciate her help with everything. Manager Response: Thank you for staying with us, Brant! I hope that you and your 'ohana can return soon. Had a nice stay. Wish it was longer. Manager Response: Thank you very much for your review. We hope that you can return again soon! As a repeat customer for many years already and many more hopefully to come I can say it is an awesome place to stay period Manager Response: Thank you for choosing to stay with us for so many years. We look forward to hosting your next vacation again soon. Manager Comments: So thrilled you loved this unit as much as we do! Manager Response: Aloha Chad and thank you for the review! We appreciate you choosing to stay with us. Hope to hear from you again soon. I was fortunate to meet with them and they were very pleasant and friendly. Manager Response: It was great meeting you as well, Paulette! I enjoyed staying in the condo, it just needs a couple of upgrades. Manager Response: Thank you for your input, Paulette. The owner will be coming out this month and plans to renovate the bathroom immediately. I will update the photos on the website once completed. We hope that we have the chance to host you again soon. Nicole was great and responsive. I was surprised tho that she was not aware of some of the issues with the interior of the unit...seems the cleaning staff does not communicate issues to the owner/manager. Manager Response: Thank you for your input, Marion. I have spoken with the housekeeping staff and we will make the changes necessary to be certain the unit is always prepared for guests. We love Turtle Bay and make it an annual "thing" for the Thanksgiving weekend. We are used to a variety of units and have stayed in dozens (really!) This one was on the lower end of the interior state of affairs...we don't look for luxury but unit #5 is in dire need of some TLC. Manager Response: Aloha Marion and thank you for your input. Next visit, be sure to contact us via email and we will be sure to put you in a unit that has been upgraded. We are working with the owner of unit #5 to make some upgrades. The location can't be beat so we are confident that this unit will go from being our 'budget unit' to one of our best in the near future. Hope to hear from you again soon. Nicole was great to work with, anything that we needed was promptly taken care of. Very nice property, was very clean and easy to find everything. Manager Response: Thanks, Lee. It was wonderful to host your group while out here on vacation. We hope that you all can return soon. Nicole was prompt with her responses anytime I contacted via email. This was a last minute reservation and everything worked out very well. Manager Response: Thanks, Kendall! It was great working with you. Property was good. I have stayed at the Condos 4 times now, with each time being a different condo. Two east and two west. The location was great for our needs of mostly golfing everyday. The condo was well stocked. Everything worked. Big TV for a condo, loved it. Also, the only thing would be possibly having a second AC unit in the living room area. We had kona winds and a lot of humidity so not much cooling during the day. Overall, with such a last minute reservation (2 days prior to leaving for Hawaii) things turned out well. I would stay in this unit again. Oh yes, the bed was quite comfortable. That is usually a major issue for me and this trip I slept pretty well. Manager Response: We are happy to hear you enjoyed your stay. We hope that we can host you again on your next trip to Hawai'i. Nicole Lincke responded immediately to all of our questions (sent via email) and made us feel like we were welcome guests. The check in/out instructions we received in advance were helpful. But we did have to contact the Security Guard the night we arrived as we couldn't find the parking spot for #33; he was very kind and patient with us. Manager Response: Thank you for your review, Laurie and I'm happy that you felt like part of our 'ohana! I appreciate your input and will be adding a map of the parking area to the check-in instructions to help future guests find their parking spot quickly. This corner condo was easily accessible and convenient to the North Shore beaches. 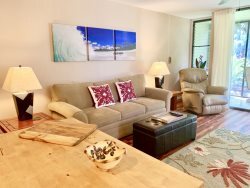 It's just a 10-minute walk to Turtle Bay and a 10-minute drive to Laie. The full-size kitchen appliances, dining table, living room space with entertainment center, bedroom with TV and A/C, bathroom, and washer & dryer, made our vacation stay very comfortable. The screened-in lanai was a perfect place to eat breakfast and catch the sunrise. Manager Response: I agree that our condos offer such a convenient location for anyone that wants to experience the North Shore. We hope that we can host you again soon. Excellent! Really like that we can book via your website now! Manager Response: I agree! We are thrilled that guests can see availability and view photos of each unit. Thank you for your input. We are happy with your services. Unfortunately this time the condo was disappointing. We trust that it was one-off bad luck and will book with you again when we return. Manager Response: Thank you for being so positive and willing to give us another shot. This unit does need a kitchen remodel and I'm thrilled to say that we will be renovating this month! We will update the photos online once completed. We hope that we can host you again soon. I have always been treated well when working with Turtle Bay Condo's. That is the only place I will stay if available on the dates needed. Looking forward to the next visit. Manager Response: Thank you, Nancey! It was great meeting you and we hope to host you again soon. The only thing that would have made our stay better was the availability of a slow cooker inside or a grill outside. We had a bigger group and we fixed most of our meals at the property. These two things would have worked great as we caught fish for meals and wanted to BBQ. There was no other complaint from all of my guests. Manager Response: A slow cooker is a great idea to add to such a large unit. We will add one to the condo on our next shopping trip. Next visit, grab some charcoal on your way because each of the three pools has grills for your use! There are tables, chairs and lounges there too to relax while you cook. We hope that we can host you and your group again very soon. Manager Response: Janet, thank you so much for your review. We hope that you choose to stay with us again in the future.